Ecola Creek Forest Reserve now totals 1,040 contiguous acres of forest. In 1999 the community of Cannon Beach was presented with a rare opportunity to purchase 120 acres of the Ecola Creek Watershed to protect the land, water, and wildlife habitat there. The property included three-quarters of a mile of Ecola Creek frontage within a diverse forest of spruce, alder, hemlock and cedar, including a remnant of old-growth rainforest where several western redcedars estimated to be more than 350 years old still thrived. The creek had been identified as an essential wild salmon habitat by the Oregon Department of Fish and Wildlife. With a citizens’ group leading the fund-raising, NCLC stepped in to lead educational tours, help move the deal forward, and make the campaign a success. 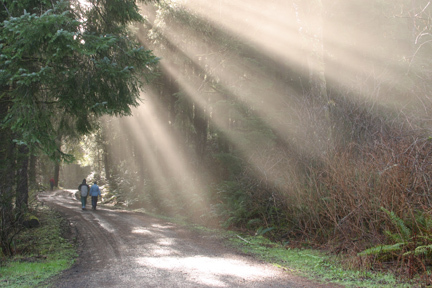 NCLC was thrilled when, in 2009, the citizens of Cannon Beach approved a $4 million bond measure to expand Ecola Creek Forest Reserve by purchasing an additional 805 acres of the Ecola Creek watershed. Together with lands already in city ownership, Ecola Creek Forest Reserve now totals 1,040 contiguous acres of forest.